Actress Roxanne Fay holds us throughout with her honesty in this one-woman show. Roxanne Fay as Miriam in Urbanite Theatre's Apples in Winter. What could sound more homey and inviting than a freshly baked apple pie, warm from the oven and smelling of delicious fruit and spices? It’s a dish that’s bound to make you think of your mother or grandmother at work in the kitchen on a cool fall day. There’s an apple pie in the works at Urbanite Theatre in its production of Jennifer Fawcett’s one-woman play Apples in Winter. 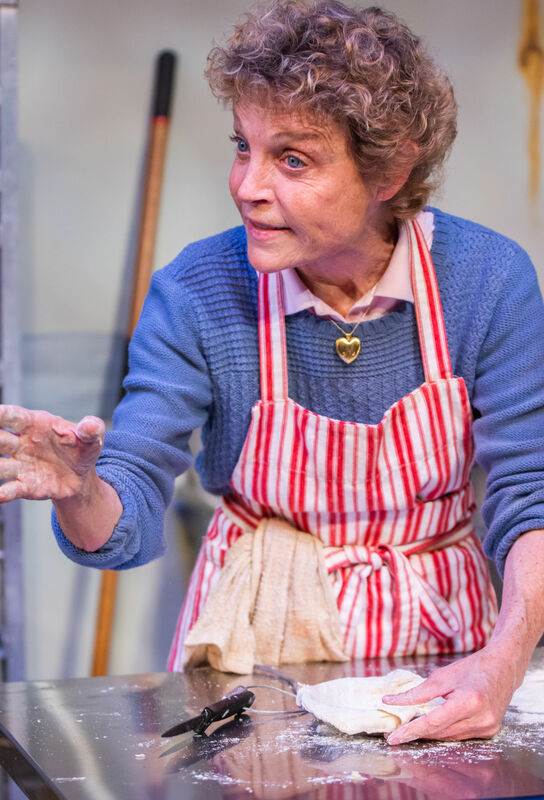 But it’s not being cooked in Grandma’s home kitchen, but rather in an institutional one, where voices and sounds outside its doors occasionally remind us that we are, in fact, inside a prison, where mother Miriam (Roxanne Fay) is preparing a pie for her adult son. I’m not giving away much by revealing that, for it’s very soon that we begin to see Miriam/Fay commence work on the pie even as she tells us the reason she’s baking it. As she prepares her ingredients, mixes dough with her hands in a bowl, slices Granny Smith apples and rolls out the crust, the character shares with us that her son, Robert, is a prisoner here—in fact, on death row—and has been for more than 20 years, and that the pie is what he wants for his last meal. Of course she will make it, no matter how heart-breaking it is to do so; as a mother, what else can she do for him? The circumstances of his crime and of his childhood and youth come out as Fay assembles her pie. Miriam herself did not come from a loving family background, so she and her husband Larry were determined to provide one for Robert. But the son was troubled sometimes even as a very young boy, and matters worsened in high school, leading to addiction and beyond. Roxanne Fay in the prison kitchen, designed by Chad Eric Bergman. How and why are the questions Miriam keeps asking herself, and us, but there are no answers. In just a little more than an hour’s running time, Apples in Winter describes the arc of a life, and the love of a mother that is unfailing despite everything. That the play manages to envelop us so fully is testament to Fawcett’s story, and to Fay’s performance. 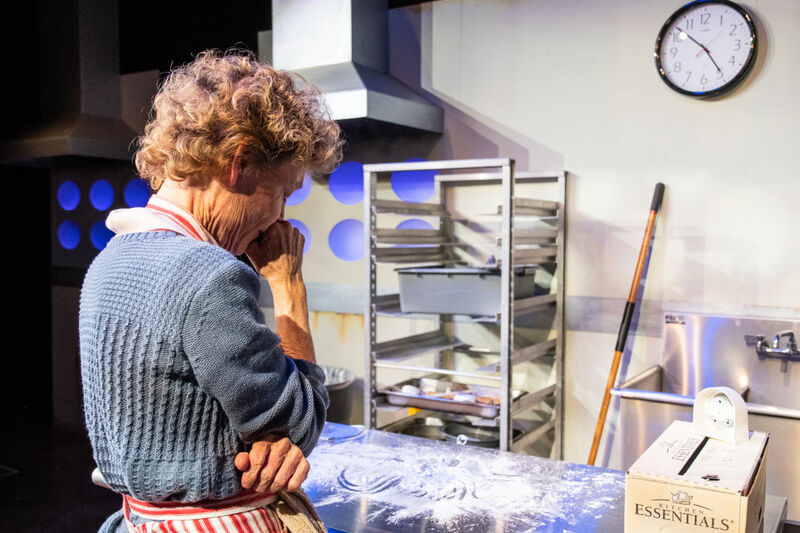 Warm and honest, Fay uses the intimacy of the play and the small theater space to engage us directly in her every emotion; we feel we know her, and so when there are moments of no speech, just the silence filled by a ticking kitchen timer, we can imagine what she is thinking from the look on her face. Chad Eric Bergman’s prison kitchen is both sterile-looking and functional, with stove, sink, cutting board (knife securely attached) and a clock on the wall constantly reminding us of just what’s at stake here. Kirstin Franklin’s direction is taut and assured, helping Fay to deliver a very moving (and what must be for the actress, draining) performance. Apples in Winter continues through Feb. 17; for tickets, call 321-1397 or visit urbanitetheatre.com.